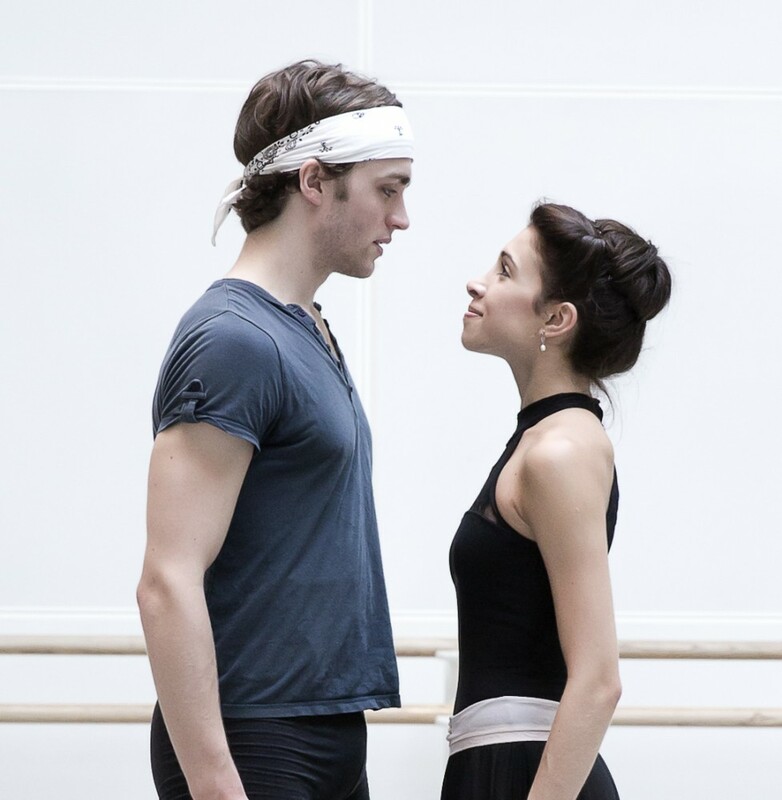 Yasmine Naghdi and Matthew Ball are about to make a joint début as the young lovers in Kenneth MacMillan’s Romeo and Juliet. It is part of the current run at the Royal Opera House to mark the ballet’s 50th Anniversary. For these young dancers – she’s a Soloist, he’s a First Artist – it’s a big opportunity and another rung up the ladder to the top. It’s not, however, the first time that the two have danced together. We danced Olga and Lensky in Onegin last season – says Yasmine – that was the first pas de deux we danced together. We also danced together in Wayne McGregor’s Infra, the finale pas de deux, in New York so I love to think of this as the beginning of our partnership. I value Matthew a lot as a person, a colleague and as my dance partner, and we work well together… it just all feels so natural between us. Both of them have come through The Royal Ballet School, though not in the same year: Yasmine is 23 and Matthew, 21. I remember being a year-nine student – aged 13, Juliet’s age! – when he joined in year-seven when he was 11. It’s strange to think that we were just children at White Lodge and now we are dancing a big début together! If someone had told us then, we would have never believed it. Matthew’s a great partner, I love dancing with him and we really have such trust in each other. It is our White Lodge background that binds us. Yeah, a little bit. It’s certainly a huge opportunity. Shakespeare’s Juliet is just thirteen, but Romeo’s age isn’t specified. Many commentators think he’s in his late teens or early twenties. In in Matthew’s case, the dancer and his character could be the same age. As Romeo and Juliet presents such an ideal of love, of what love can be, it has to be young… it has to be unrestrained and carefree… rough around the edges I would say. I definitely feel it in the choreography and the steps. I think the role has to be rude and grimy at the same time as having an incredible purity to it. The play its full of innuendo and sexual connotations… jokes… fooling around with your friends and stuff. I try and play it as relaxed as possible and not to stand there looking like a refined gentleman from Verona. I hope I can bring that to the part. Certainly it’s great to have Yasmine with me, younger than most of the Juliets for sure. I’ve been in Romeo and Juliet since I was a student, and I rose to become ‘Juliet’s friend’ so I’ve always been able to observe whoever was dancing Juliet, whether I was dancing in the ballroom scene or when standing on the staircase as Juliet’s friend. It is a role that I have watched with a lot of passion and, of course, I was dreaming of dancing Juliet at some point in my career. I have danced numerous soloist roles, but to dance a principal role in one of the most beautiful full-length classical ballets ever created is a true honour for me. One of the things that I’ve been considering a lot is the difference between his infatuation with Rosaline at the beginning, and how you can make it different from what he discovers with Juliet. At the beginning he’s got a heavy heart, depressed by this idea of love: love is cruel. But when he sees Juliet it is completely natural and simple, it makes him elated, and brings their love up to a different plane entirely. He’s just joyous. At the same time as this happens, though, it kicks off a chain of events which leads to complete disaster… tragedy. It’s a hard mix to get, between his moments of absolute ecstasy and real grief… I mean, you watch your best friend die, at your hand almost. For me the real change is from the Romeo at the beginning and the Romeo after he sees Juliet. From the moment when he says, “But he that hath the steerage of my course, direct my sail”, he becomes a new man. Like Matthew, Yasmine too uses Shakespeare’s text to inform her interpretation of MacMillan’s choreography. Shakespeare’s play has had an influence on how I understand my character and her interaction with Romeo. I’ve also watched Zeffirelli’s film Romeo and Juliet with Olivia Hussey, who is absolutely incredible as Juliet, as a reference for acting out the character. I also have quotes from the play in my mind as I dance, for example, the moment when she realises that Romeo is from a rival family, “My only love sprung from my only hate!”, and “A rose by any other name would smell as sweet”, and so on. I have an audiobook of the play, so when I’m on the tube making my way to and from work I listen to it, and I also have the music on my iPod. It’s such a fabulous score, a veritable love story, and the fact that it was MacMillan who created this ballet… it’s hard to describe what I feel! She grows from an innocent girl into a love-struck young woman who is caught between the two feuding families: situations like this can still occur in the 21st century. It’s a universal and timeless story that’s for sure, and I think Romeo and Juliet out of all the Shakespeare plays translates very well to modern adaptations. I’ve watched the Balcony and Bedroom pas de deux for many years so I had a good notion before I started of what was required. Of course I’ve been studying the role and also watching different dancers. I knew the steps and it is so musical which really helps me retain the steps, but I don’t want to think about the steps when I dance Juliet… I want to be Juliet. Her thoughts, her emotions, her pain, her mental struggle, the choices she has to make in a very short space of time, those are all very important elements and are vital to get across. Her emotions will lead me through the ballet and the steps will enable me to move. It is in her moments of stillness that the true Juliet becomes visible. In the partnering there can be some tricky moments and if your partner is slightly off and pulling you in, it’s not going to work. This is precisely what you work on, what you develop when you work with your partner; you sense what the other is going to do. Because Matthew and I have already worked together on other roles, I feel very safe and comfortable in his arms. We have great trust between us and we know what one another is going to do, so if there is something that doesn’t quite work we’re able to mould it together so that it doesn’t show. At least that’s what I like to think! Matthew enjoys partnering and says that most of the time he doesn’t find it all that difficult. It’s a great feeling when you are in sync with a girl. The thing that I found hard here though, is that this is MacMillan, it’s not just any pas de deux. I’ve done grand pas de deux before, and quite a lot of partnering with different girls, but in the Macmillan ballets there is a whole new way of touching and use of weight, and it takes a while to get used to it. Everything’s close contact and you have to counterbalance the girl’s weight of a lot of the time, which takes a lot of trust. But when you find it, it makes perfect sense, and then the dancing can be so unrestrained and you can give yourself to your partner. Yasmine is really easy to partner, but it’s a big step on from what we last did in Onegin, though we found it relatively quickly and the partnering has been a real pleasure. It’s something you don’t get to do that much of in school, so it has been a new experience. Three incredible people, each very inspiring in their own way. Leslie danced the role so many times and she has a world of experience and information to pass on. Johnny is an amazing coach and he danced Romeo so many times and was known to be an incredible partner. Sometimes when we were rehearsing he would partner me and the little girl in me was very excited to be partnered by Jonathan Cope… an enriching experience. You couldn’t dream of a better coach to rehearse partnering work. Julie Lincoln has been magnificent; she knows just what to look for. She has seen so many Juliets before and she knows precisely what she wants, down to the smallest detail. I really appreciated her eye and her expertise. It’s been an incredible journey. He’s is so experienced and invested in these roles. His skill at dance, acting and partnering sets a great example. However, since he’s a Principal coach he doesn’t let his opinion intrude onto me, he’d rather that I find things for myself, and with the acting side I feel that he trusts me to make an educated decision about it, because if it doesn’t make sense to me, then it doesn’t make sense to anyone. He’ll give me hints and ideas, but it’s no more than a poke in the right direction, he certainly doesn’t push me into any mould. Although being in the corps for Swan Lake isn’t exactly a walkover, there must be a difference, especially psychologically, from dancing the lead. I know it sounds strange, but Principal dancers told me that Juliet isn’t technically hard to dance. You may be surprised if I tell you that I find dancing in the corps of Swan Lake harder than dancing Juliet. Her solo and two pas de deux are technically not that demanding for me. What is more demanding is that the dancing really must come from deep within your heart. I feel I have reached the point where I’m simply enjoying every moment of the dancing; I don’t have to think about the technicality of the steps. I’d say it’s my emotions that will to do the talking, not only the dancing. The steps have to lead me, physically move me, through the story. It’s like when a poet puts his pen to paper to write a beautiful love poem: he uses words to write his phrases but it’s the deeper meaning behind his poetic words and phrases that will move us, not the actual words in themselves. When we did our first complete run-through, I felt my legs get quite heavy. I don’t know whether that’s nerves because of running it for the first time, but what I want to focus on is keeping calm, keeping relaxed and being mentally in control. As soon as you tense up, as soon as you let the nerves get the better of you, then that’s when things go wrong. I just want to feel free and let the music carry me through the movements and that’s what I have been dreaming of: to be able to free myself and to just let go. I was absolutely exhausted after the first run. Keeping it together finally and experiencing it from start to finish is a completely different thing, and by the end you are not only physically exhausted but emotionally as well. Their début performance on the Royal Opera House stage is now only hours away. The story is so very real and I have got Prokofiev’s incredible score, so once I put my costume on and do my hair I’ll be transformed. All I want to be is the young girl that is Juliet: she’s innocent and playful at first but grows up fast as she has to deal with the reality she’s confronted with in an intelligent but also stubborn way. I don’t need to be anybody else but her. I’m very excited to say the least. Matthew realises that it’s a big responsibility, but he’s being very philosophical about it and trying not to dwell on it. It would be a huge burden if you thought about it too much, so I like to think that I’m entitled to it: I’ve worked a long time for this, and I’ve got the opportunity… why not make the best of it. They deserve this opportunity, i agree with you. Seeing Matthew Ball in rehearsal surprised me in a good way, he’s awesome, elegant looking but passionate, i would be an interesting Romeo (or whatever prince). ABT i.e. Skylar Brandt, Devon Teuscher and Gabe Stone Shayer. they were also very young. Absolutely well deserved with no doubt. They are young and beautiful, having that beauty and purity ever conceived when thinking about Romeo and Juliet and they are just awesome, hugely talented. They will certainly make a perfect Romeo and Juliet. I wish them all the best. A wonderful start for two future, certain stars of The Royal Ballet Company. I watched their debut in the matinee on 3rd October and it was simply breathtaking. I cannot now see Juliet as anyone else but Yasmine and her first scene demonstrated a huge amount of skill, not just at a technical level but also in the depth and roundness of the performance. The chemistry between them was also visibly apparent and is sadly something that often lacks from other performers but is an absolute must for this piece. Not a dry eye in the house and a very much deserved standing ovation for the pair of them with what seemed like 30 bunches of flowers for Yasmine.